Diopside Genuine is a rich gemstone green you’ll reach for time and again. Also known as the Russian Emerald, the mineral is usually seen in fine jewelery. We are proud to be the first to offer it as a watercolor. 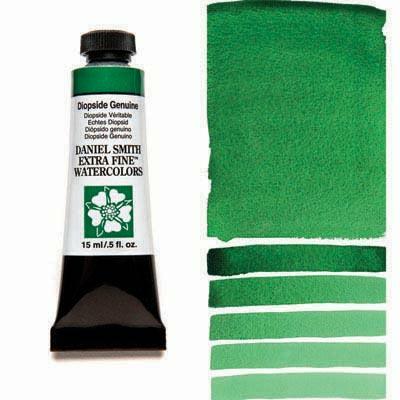 Exquisite in hue, it brushes out evenly from deep bottle green through clear Kelly green to palest mint. The chromium rich stone from which it’s ground is green with brownish inclusions. In washes hints of the brown mineral settle out, adding an earthy nuance perfect for landscape work.